News about the evolution of conversational agents, virtual agents, chatterbots, brand agents, whatever terminology you prefer. 2012 Loebner Prize will be webcasted live! 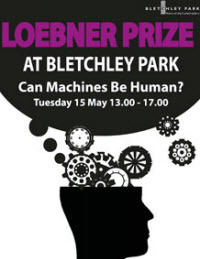 The 2012 Loebner Prize contest will take place in Bletchley Park on Tuesday 15th May 2012 to mark Alan Turing’s centenary celebrations. The contest is being run by David Levy who won the prize in 1997 and 2009. A team from the University of Exeter’s Computer Science department (Dr Ed Keedwell, Max Dupenois and Kent McClymont) will be running a webcast of the Loebner Prize and so, for the first time, interested people from around the world will be able to follow the conversations the judges have as they happen. Read more about: 2012 Loebner Prize will be webcasted live! MyCyberTwin, a new generation of artificial intelligence technology, today announced the launch of its Turing Test Challenge. The contest gives developers the needed tools and instruction to leverage MyCybertwin’s AI Platform to build intelligent virtual agents (IVA’s) and compete head-to-head with other developer agents. Wikipedia defines the ‘Turing Test’ as a test of a machine’s ability to exhibit intelligent behavior. It was first introduced by Alan Turing in his 1950 paper Computing Machinery and Intelligence highlighting the ability for machines to think. Second Place goes to Mitsuku by Stephen Worswick. My chatbot, Suzette, won this year’s Loebner Prize contest and even confused a judge into voting for her over a human (or should I say he confused himself). But here is the blow-by-blow of this weird event. When I arrived at the contest, I figured I had good odds to win if nothing went horribly wrong. Yes, Suzette had easily qualified over the 3 other competitors (her score 11 pts, the nearest competitor 7.5). Her design and data naturally gave her an edge over her competitors on the human knowledge test questions of the qualifiers. But human judge chat was an entirely different matter than the qualification test. Still, I felt she could carry on a detailed conversation better than the others and should win. Initial installation of the programs occurred on Friday. From prechat conversations with the other contestants I learned that A.L.I.C.E. came with 3 redundant disks. Yet all three turned out to be blank! What a scare that must have been. Dr Wallace managed to install by retrieving the program over the Internet. Cleverbot is now at 45 million lines of memorized user chat (at a rate of doubling every year). And UltraHal is now listening to tweets, so has 300K of user chat it learned and 400K of tweets it has accepted for learning (code decides if the user has had enough responses and doesn’t trigger any red flags). Summary: Open-hearted interview with Hugh Loebner, initiator of the very first Turing Test 20 years ago. In this open-hearted interview, Hugh Loebner, initiator of the very first Turing Test 20 years ago, talks about how it all began, about the future of this competition, and about his personal involvement. He also talks about his renowned protocol which is generally regarded as quite annoying, and always a topic of discussion. The video was shot during the last Loebner Prize Contest in Brighton last year. The 2010 Loebner Prize Competition in Artificial Intelligence will be held on Saturday 23 October 2010 at California State University, Los Angeles, USA. The Chatterbox Challenge 2010 Contest Just Started! Summary: The Chatterbox Challenge 2010 Contest Just Started! I’m glad to announce the beginning of CBC 2010 contest, good luck for all botmasters and thanks for participating. This year is full of surprises for botmasters and their chatbots. I’m glad to announce the beginning of CBC 2010 contest, good luck for all botmasters and thanks for participating. Read more about: The Chatterbox Challenge 2010 Contest Just Started! The Chatterbox Challenge (CBC) is an annual contest which starts in mid March that allow any chatbot developer to participate and evaluate the intelligence of the chatbot through turing tests and much more. It is a really fun, simple and inclusive way for all children to practise their speech and language skills, it will be also interesting and amazing for anyone who wants to chat with the best chatbots. The Automated Negotiating Agents Competition (ANAC) advances the development of intelligent agents with autonomous negotiation skills. The competition will be held in spring 2010, with the finals being run during the AAMAS 2010 conference. The reward for the winner of the competition is €1500.